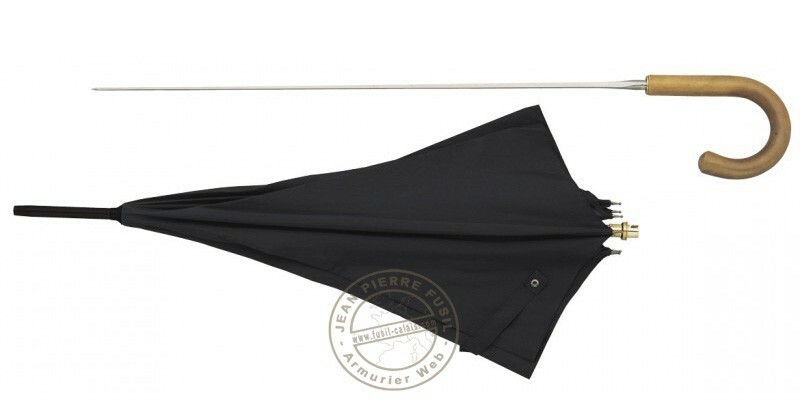 A real umbrella, with a black cloth, with a curved wood handle, with a fencing foil blade within the body. Created in 1860, the french firm Herdegen was first of all a manufacture of sticks and umbrellas. So came the association of the 2, and the proposal of an umbrella, with a blade within. The umbrella has a total length of 93 cm, and the blade is 58 cm long. The body is made of teinted and varnished wood. The curved handle is made of Malacca. To unlock the stick and take out the blade, just press the handle, and turn it 1/4 turn (approx).